The Slanted Door is a famous modern Vietnamese restaurant located in San Francisco’s Ferry Building. Legendary chef Charles Phan’s empire includes several Out the Door restaurants and Hard Water. He failed at Heaven’s Dog and Wo Hing General Store. They use a lot of local, organic, sustainable ingredients and focus on essentially California cuisine with the Vietnamese influence. The original modest Slanted Door opened in 1995 on Valencia Street. Lots of positive reviews, celebrity visits, and presidential visits propelled this place to stardom. Slanted Door relocated to the Ferry Building in 2004, helping make this place a foodie haven. This restaurant is still very popular, be sure to make reservations way in advance. Decor, Vibe – The Slanted Door has a large lounge and glass bar area with futuristic backless chairs up front, where those without reservations can order a full menu. Outside patio dining for warmer days, a booth seating area, large open kitchen, rescued wood tables and chairs. Slanted Door was busy, loud, and filled with well-dressed diners and some obvious tourists. Daily changing Menu has a wide variety of items from raw bar to spring rolls to noodles to meat, poultry, seafood, to sides. Decent variety for vegetarians. Lunch menu is almost identical and had an item or two added or omitted. Bee’s Knees cocktail – Miller’s Westbourne strength gin, blackberry honey, and lemon juice served up ($11) was an excellent balanced cocktail strong lemony flavors and hidden alcoholic content. Tangerine Caipirinha Cachaça, pixie tangerine, organic sugar; served on the rocks ($11) is a strong cocktail with heavy alcohol flavors, but a ton of fresh fruit muddled in. crispy imperial rolls with shrimp, pork, glass noodles and peanuts ($10) are a Slanted Door signature dish and rightly so. You grab crispy roll, laying on a bed of lettuce and add some noodles and mint leaves, then dip it in the fish sauce. Your taste buds will encounter hot and cold, and crispiness from both the role and the leaf. seared dayboat scallops with spicy red curry, pink lady apples, jicama slaw ($18) had four good sized caramelized scallops that arrive quickly. It pretty tangy curry sauce was available for dipping, but unnecessary because of the freshness of the scallops. grapefruit and jicama with red cabbage, pickled carrots and candied pecans ($11) was a refreshing starter that came very fast. Lots of shredded cabbage in a zesty dressing. grass-fed estancia shaking beef, cubed filet mignon, sausalito springs’ watercress, red onions and lime sauce ($29) is their awesome classic dish. High quality steak cooked to a juicy, tender, medium rare with perfect flavor. Excellent crunchy red onions and does super strong lime sauce that is almost unnecessary. Only six pieces, making each cube cost five dollars! caramelized tiger prawns with garlic, onions and chili sauce ($18) had a good quantity of small shrimp in a spicy sweet sauce. This dish is full of strong bold flavors. chue farm spicy green beans with honshimeji mushrooms ($10) were cooked to crispy, al dente level of doneness and were bathed in a pretty spicy sauce with just a couple tidbits of the mushroom. banana tapioca dessert – avocado ice cream, crisp lime meringue ($9) was a good dessert wasn’t too sweet and had just enough creaminess. It went well with the ice cream, so be sure you get a scoop of tapioca and ice cream to meld the flavors. The meringue was super light. cellophane noodles with fresh dungeness crab meat ($18) were good but on the fishy side. Nice thin noodles with a very high amount of shredded Dungeness crab mixed in. Service – The Slanted Door had extremely professional service even when the whole restaurant was full. Napkin folding, refills, and the like were handled speedily. The friendly waiter knew the menu and all the ingredients extremely well. He explains how they used a special high-end anchovy-based fish sauce. Slanted Door even had attendants manning the unisex bathrooms. Value – Prices here are not cheap and quantities on some dishes are pretty low, but high food quality makes up for the gap. Alternatives – Nearby high-end destination restaurants include top rated Boulevard and the more glitzy Epic Roasthouse and Waterbar. Tamarine in Palo Alto serves a similar food to the Slanted Door and is very good. Verdict – The Slanted Door surprisingly met and our high expectations. The restaurant is perennially busy and deserves its great reputation. Two-page ‘riesling-driven’ wine list with Wine by the glass from $9, bottles from $35, $35 corkage. Thank you for your concise and straight forward reviews. The pictures of the restaurants and dishes also helps you get a feel for the place. 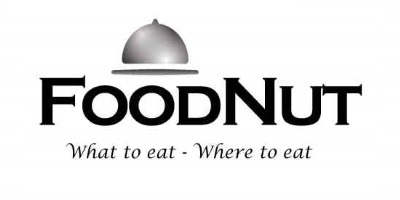 It took me awhile to hunt down an independent reviewer/blogger but I’m sure glad that I stumbled unto foodnut. I also wish you had reviews in more cities state side and abroad.